Poor California chardonnay has been taking a beating in recent years, sometimes deservedly so, and sometimes unfairly. If you open a bottle of chardonnay from the Golden State, you tense up and fear for the butter bomb worst. Headaches are not far ahead, as is a complete palate destroyer. You expect more butter than in a top tier Parisian croissant, mingling with absurd amounts of oak in a completely unbalanced proportion. Forget about pairing with food. These chardonnays often can’t even pair with water. Let us not forget however that not all California chardonnay is like this. A few sips of any of the formidable chardonnays from Liquid Farm, one of the Central Coast’s young chardonnay (and rosé) voices, and you’ll be a fervent believer in no time. 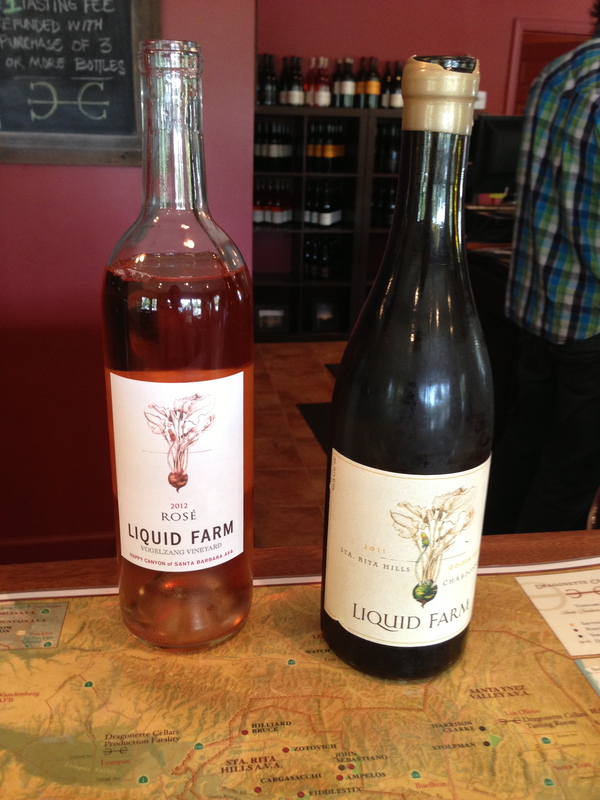 Just by the winery name you can tell that Liquid Farm means business. There’s no pastoral label evoking the rolling hills and happy cows of California. This is about the wine and good times celebrating the beauty of gorgeous grape liquid. The current vintage of Liquid Farms’ “Golden Slope” Chardonnay is truly a golden benchmark of chardonnay production for the Golden State. You can guess which color medal it would win in the Wine Olympics.You’ll be confused a bit at first by the name and label of Liquid Farm. Doesn’t the farm make the grapes that then in turn makes the liquid? Well, yes. Husband and wife team Nikki and Jeff Nelson wanted to make wine drinkers more aware of the full terroir to glass cycle, from the roots and soils to the grapes aging in the barrel. The name does purposely connect how the liquid you’re drinking comes from farming. Initially, they wanted a label with their beloved dandelions (interesting choice!) involved, but somehow a mislabeled root work of art that claimed to be an avant-gârde dandelion root sketch turned out to be a beet root sketch. After tracking down the artist who made the mislabeled sketch, the artist added a flower and color to the beet root. So, now you have a beetlion flower for your wine label. The Nelsons live in the Los Angeles area, but work with the Dragonette Cellars winemaking team in Lompoc to grow and craft their small amount of only chardonnay and rosé (more on the outstanding Dragonette wines next week, including one of the more memorable Sauvignon Blanc you’re likely to encounter). They are ardent fans of bright wines aged in neutral barrels, avoiding the dreaded heavy oak finish of most California chardonnay. Their wines possess European- style modest alcohol levels and preserved natural acidity, preferring restrained elegance over forceful, fruit- heavy power. Liquid Farm’s first vintage came out in 2009 with its signature “White Hill” Chardonnay from various vineyards within the Santa Rita Hills AVA. The AVA has proven time and time again to be a perfect chardonnay terroir and climate, with its fossilized sealife matter- enriched, limestone, and chalk- heavy soil, gentle sea breezes, year-long fog, and warm, but not too scorching hot summer days. We’ve already gone on and on about the merits of the Sandhi Rita’s Crown Chardonnay, our white wine of the year in 2012. The Nelsons graciously arranged for me to sample a pair of their current vintage at the Dragonette tasting room in Los Olivos, as Liquid Farm doesn’t have a space for sampling being such a small batch operation. There would be a line out the door of the tasting room, if there was one, for the “Golden Slope.” Instead of the usual golden hue of chardonnay, the color is a beaming tan straw hue, showing magnificent health and clarity. Lots of rich honey and ripe summer peaches burst forwards, finishing on a bright note with layered marzipan, lotus root, and dense citrus bordering on the same profile as Grand Marnier (without the bitter alcohol of course). Its grapes come from a trio of vineyards, including the famed Rita’s Crown, then gets aged 14 months in 82% neutral oak barrels, finished by being unfiltered with an added native yeast fermentation. As much praise should be lavished upon the 2012 Rosé, a 95% Mourvédre, 5% Grenache effort from the Happy Canyon AVA east of Los Olivos. It’s almost orange in appearance, glowing with a wonderful floral backbone that then leads to salted caramel. This is a perfect example to win over Rosé skeptics who think the genre is light and one dimensional. This has the spices and artistic precision to compete with anybody, including its inspirations in sunny Bandol. Here’s another example of how Rita’s Crown in the Santa Rita Hills really is assuming the throne for California chardonnay. The “Golden Slope” will be perfect for your summer lobster picnic and don’t forget about that rosé either. I can’t decide which one is king and which is queen. This entry was posted on June 5, 2013 by trevsbistro. It was filed under Wine of the Week, Wine Tasting .